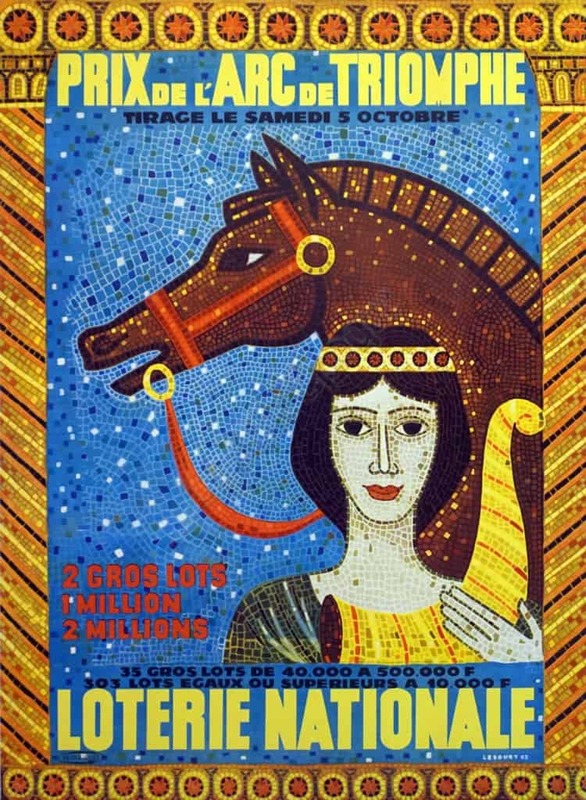 This is a Mid-Century Modern period French advertising poster for the national lottery from 1963. The piece depicts a women standing next to a horse, holding a horn of some type and locking eyes with the viewer. The style of this piece is truly unique – its trompe l’oeil imitation of the Mediterranean mosaic style is breathtaking. The elegant bordering – in the same style – of pillars on the sides and mosaic circles on the bottom serves to reinforce the stunning potency of the central image. The contrast between the classical mid-century French poster typography and the defiantly eastern-Mediterranean design of the rest of the piece creates a design that is truly one of a kind.